Graphs up to 5 piecewise expressions. Up to 5 (expression,condition) pieces are allowed. 2: Then press [alpha] [apps] (B) or scroll down. 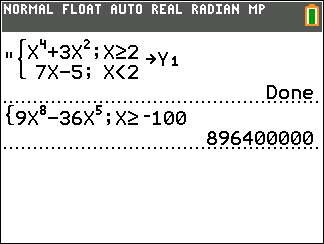 The piecewise( command is a new addition in the release of OS 5.3 for the TI-84 Plus CE. As implied, it allows for the graphing of piecewise functions in the Y= editor. The example code demonstrates how this works from within a program. This code will return the value of the expression if X≥0. So if X=0, then the program will return a value of 2. If X=3, it will return a value of 11. If X=-5, it will return an error. This command can simplify and compact the usage of piecewise expressions in programs. If you have less than 6 conditions that will never overlap, and they all affect a single variable, you can use the piecewise( command to make your code smaller, as shown below. Beware of comparability, though. ERR:INVALID is thrown if expressions are not defined. ERR:DATA TYPE is thrown if a quotation mark is not placed before a piecewise command that is to be stored to an equation variable.